Science. Technology. Engineering. Math. These are the four pillars of STEM, fields in which women are historically underrepresented. To raise awareness, AKQA launched a campaign called “Inspire Her Mind,” a provocative TV ad that illustrated how words can support girls' love of math and science. I was a part of the digital team brought on to design a supporting, informational website for the campaign. It focused on how social cues may push girls away from pursuing their interests in STEM at a young age, and how parents can help foster more supportive environments. We aimed to provide impactful statistics and interviews with significant female innovators. I designed a responsive website in collaboration with creative directors. Our creative directors had an fantastic concept to design a choose-your-adventure interactive as a conversation starter. Sliding left, a user sees the potential effects of pressure from gender norms and abandoning worthwhile STEM pursuits. Sliding right, a user sees the potential of supporting young girls’ initiatives in their chosen interests. Does dress-up determine her future? 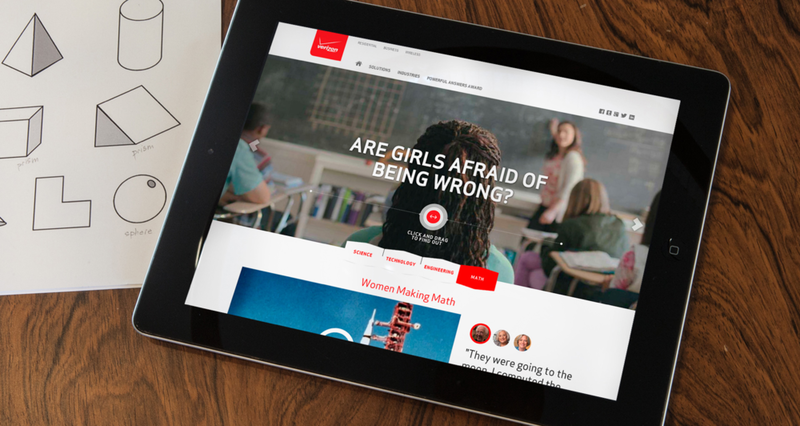 Are girls afraid of being wrong? A gallery of words with impact (statistics and quotes) helped spread the word on social media. Our words can have a huge impact. Isn't it time we told her she's pretty brilliant, too? This was my first project working with a big client on "cause" marketing. As it didn't deal directly with new technology, I naively questioned if it would be interesting. In hindsight, Inspire Her Mind turned me on a more thoughtful mindset with subsequent projects. I feel grateful for the opportunity, and this experience holds a special spot in my heart. The team was full of fantastic human beings who continue to inspire me. It was also exciting to be part of such great press. We even received a team "Thank You" letter from Sheryl Sandberg herself. I wanted to congratulate all of you on the Inspire Her Mind campaign. I loved the ad and shared it on Facebook last week. I’ve also checked out the resources on your website and am very impressed. Getting more girls into STEM is critical for our economy and I really believe that your work will help to move the dial. Congratulations again and thank you for all that you are doing to contribute to gender equality.